Hi gang, just a quick note that my review of the fab Fujinon XF200mm f/2.0 for motor racing is live at FujiRumors. Many thanks to FujiRumors editor Patrick DiVino for publishing it in its entirety and to Fujifilm North America for the short-term loan of the X-T3 and XF200mm f/2.0 for this test. This review was based on AF performance testing conducted for Fujifilm NA between the X-T3 and X-H1 for motorsports. $6K is a LOT of money for me to spend on a lens especially since I'm not a pro. Thanks, Ron. 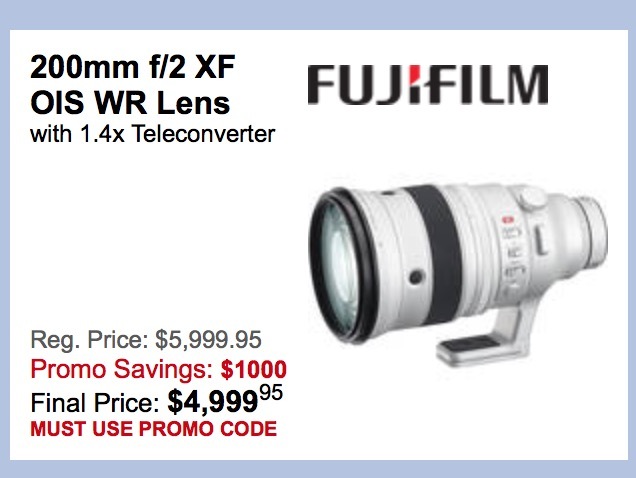 It is a fabulous lens, and right now it is on a discount by Fujifilm for $1000 off. I know that $5000 is a still a lot of money for a lens, but for this lens, it is an incredible price. I've owned and shot extensively (13 years) with the Canon 300mm f/2.8 and 500/4 (the latter for MotoGP), and also shot with the legendary Canon 200mm f/1.8, and the Fujinon XF200mm f/2.0 is better than all of them. The advantages of the latest in lens R&D, tech and manufacturing, I would presume. For me, as I now only have two professional races to cover at Sonoma Raceway (they lost the Indy Car Series to Laguna Seca starting next year), I will just rent it. There is indeed $1000 off at the present. That brings the lens down to $5999, which I think of as $6000 dollars. Ahhhhhhh...... I didn’t see that a promo code was required. I did look for the lens at B&H though. Doesn’t matter. An X-T3 is a higher priority for me and $5K would bust my piggy bank. I love my X-T2 but some of the new features in the X-T3 are tough to resist. 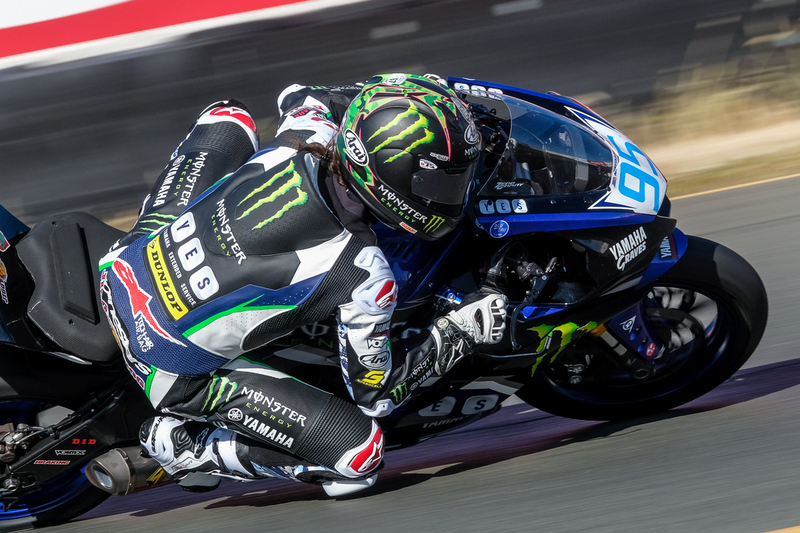 Having shot extensively with the X-T3 alongside my X-H1 (over 6000 frames/each), for my applications, which is primarily motorsports photojournalism, I don't see any reason for me to get an X-T3. I did extensive (>12000 frames for both cameras) AF performance testing between the X-T3 and X-H1 shooting for motorsports for Fujifim NA, using XF200 as the reference lens. I then did an extensive & thorough statistical analysis using 2-proportion tests generating Z-scores and p-values, and on the whole for the six different scenarios I tested the cameras for using continuous, high-speed AF performance, there was virtually NO difference with any statistical significance between the X-H1 and X-T3, whatsoever. The X-T3 has got some great video features, but having shot with my X-T2, X-H1 and X-T3, of the three, I prefer the X-H1. Its performance for my applications is identical, and it has a better body, grip, shutter, back-button AF button, and controls interface for my applications than the X-T2 or X-T3. It also has, in my experience, more accurate metering and an image quality than I consistently prefer to the X-T2 or X-T3. Stephen, I can't argue with your logic. I just don't see the $200 value, for me, for the IBIS in the X-H1. Don't get me wrong, it would be nice in some situations but that's not an overwhelming use case for me. The ergonomics you mention for the X-H1 are appealing. With the X-H2 apparently off into the 2020 timeframe, the X-T3 still looks like a good buy for me. I no longer shoot triathlons or cycling events but I do shoot some HS football and horse racing as a second shooter for a friend mostly using my 100-400. The X-T3 AF improvements over my X-T2 will likely be a boon for those events. These days a lot of my photography is more oriented to landscape and small town walkabouts in the Blue Ridge. Its astounding thing to me that Fuji has two great APS-C rigs. I can't get much better than that. I can't argue with that! And, I didn't buy the X-H1 for IBIS, I bought it because I really liked the design, controls, body, grip, top panel display, shutter button and shutter mech in particular, back button for AF size, shape and position, and the outright ruggedness, durability of the body and, if my theory is correct, the optical tolerances that the X-H1 is manufactured to. if the camera is set to C and A on the lens and the ISO is set to A how does it preform thru the viewfinder (either H-X1 or the XT-3 as compared to the X=Pro2. I usually shoot all M but I have recently tried the Auto ISO with Exp Comp set to C and the EVF is not quite crisp or quickly responsive should I say. I have the Arcos simulation on so I see the images in B&W (similar to how I shot with my M240) for years. But the B&W acts funny in contrasty situations I might have to go back to color. Especially for focus peaking its almost impossible to see the red or blue focus areas in low light with the B&W simulation. I also don't like the fact that the histogram dwindles down so small that you can't see it in the above shooting solution. So Im constantly calling up the 3 color histogram. If the newer cameras are 100% better I get rid of my X-Pro 2 bodies tomorrow let me know your thoughts PLEASE. Why no real pan shots in the images for the review ? Everything is shot nearly head on or trailing, no pans showing motion. Nothing that demonstrates the lens' ability to create nice separation of subject and background with Bokeh. Oh and a "micron" is an abbreviated term for "micrometer", or a millionth of a meter (1/1,000,000 meters). Your article states "....less than 0.1 microns (less than 1/10,000th of a millimeter) " A typo I guess. Sorry I'm just trying to understand how you demonstrated the capabilities of the lens. Fast sports are typically shot with fast lenses, which this Fuji is, but you stopped it down to F/10 and F/11 creating images that could be taken with many lenses. It's odd that your review mentions bokeh three times but shows no examples. Indeed, the widest aperture you shot at (of the photos shown) is f/9. And given that you were shooting in AF-C with the lens stopped down the whole time, what does this really tell us about AF performance differences between the X-H1 and the X-T3? Did you take any wide-open shots at all? Did you test the autofocus capabilities in AF-S, which, unlike AF-C, focuses wide-open and then stops down to your chosen aperture for the shot? I understand you've stated you were tasked with evaluating the lens & body performance in the context of sponsored shooting of motorsports where you needed a very deep depth of field for tack-sharp sponsor logos on cars. But given that... what's left in your review that we can generalize to other use cases? Anything? Not trying to be excessively critical. Just trying to understand. The purpose of my using this lens was for testing the AF performance between the X-T3 and X-H1. This was not a lens test, as a matter of fact, in this AF testing, the lens was configured to be a non-variable "control factor" for this study as it is Fujifilm's fastest focusing lens. Any differences would therefore be based on the performance between the two cameras, not the lens. For motorsports, one shoots in shutter priority, and for the scenarios under test, I shoot at 1/500th of a second. At ISO 400, depending on how bright it is at the time, this puts the f/stop somewhere between f/9 and f/11. Also, I need the cars to be sharp from front to back so that if a car appears to be "soft", its due to the AF system and NOT from a lack of DOF. And yes, there are other lenses, e.g. the XF100-400 that can shoot racing cars at f/9-f/11 at a comparable focal length, but those photographs will not have the image quality that is obtained from this lens. You have to view the images at full-res in 5K on a large display to see these differences, or better yet, make large prints at 300 dpi. The reason there are no panning shots showing "motion" is because, quite simply, this lens is 4X too long for a panning shot at the corners I shoot at with credentials for this track. 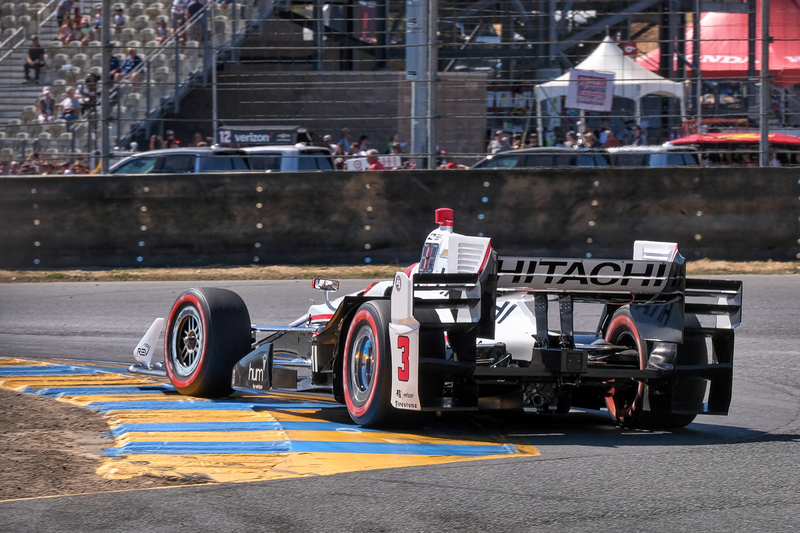 The typical focal length for a panning shot of a car at Sonoma Raceway is 70mm, not 300mm. Moreover, panning shots don't really stress the AF system very much because the distance from the camera to the car or bike doesn't change very much at all in a side-panning shot; I can nail those all day long, witness this panning shot taken with the 50-140 f/2.8, which is the lens I would use at this track for panning shots (this is an X-T2 shot, which, BTW, also works REALLY well). The scenarios that stress AF systems are situations with a high rate of acceleration, particularly out of a slow corner where the rate of acceleration is the highest. The most challenging situation for maintaining AF lock and tracking is a racing vehicle rapidly accelerating AWAY from the camera, e.g. this photograph (this is an X-T2 shot, also). Yes, I know that, technically, the term is micrometer, I'm a scientist by profession. The reason I specifically chose the term "micron" is because that is the unit of measurement that is most widely known by the lay public. That's because the shots I took with the lens wide-open to examine bokeh were not motorsports photographs. And given that you were shooting in AF-C with the lens stopped down the whole time, what does this really tell us about AF performance differences between the X-H1 and the X-T3? 1: – The lens was stopped down because motorsports photographers shoot motor racing action in shutter speed priority for racing photographs. At 1/500th sec at ISO400, that usually puts the lens at an aperture of f/9-f/11 depending on the amount of sun and time of day. 2 – and the most important reason: I had to remove image "softness" due to a lack of DOF from the test results, so I needed an aperture that rendered a car sharp from front to back. If any car was not sharp, then I knew it was because of the AF system, and not because of insufficient DOF. Insufficient DOF in this study was a noise factor that would impact overall experimental accuracy and variance of the respective AF systems under test. As for the differences between the X-T3 and X-H1 in terms of AF performance, based on Z-scores and p-values for the six scenarios overall, I can state with 95% confidence, there is no statistically significant difference in AF performance between between the X-H1 and X-T3 for the centroid of the 2-proportions test. That speaks to just how good both cameras actually are. There is a difference between the two cameras with respect to study variance. I'm not reporting actual numbers because that is privileged data for Fujifilm R&D for development purposes. Did you take any wide-open shots at all? Nope, not for the racing testing I performed for the reasons I cited above. This was an AF test, not a lens test. If you want to see excellent photographs using the lens wide-open, look up Jonas Rask's review. Did you test the autofocus capabilities in AF-S, which, unlike AF-C, focuses wide-open and then stops down to your chosen aperture for the shot? No, you can't track a car going over 120 mph with the AF system set to AF-S. I was tasked with evaluating only AF performance between the X-H1 and X-T3 for motorsports with cars at speed (actual race pace). As this was not a lens test, the lens was configured to contribute as little variation as possible so as to minimize the impact of noise in the statistical analysis of the data set. My comments on the lens overall are in the article's summary. These are GORGEOUS photos, Stephen!!!! The lens and the camera have performed amazingly. Thank you for reiterating your parameters for your review. Hopefully others will understand now exactly what and why you took the approach you outlined. It is an amazing lens. Yes, I had to approach this very systematically so that the data would be maximally valid for Fujifilm NA to be able to make meaningful and statistically valid inferences from the data.